Combine two contrasting Duette® fabrics or even a Duette® with a Plissé fabric in one shade for one window. During the day, enjoy the view through a highly transparent, light filtering fabric; at night, switch over to a more opaque or even a black-out Duette® fabric to eliminate light and ensure privacy. 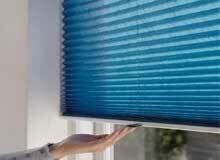 The ultimate in versatility, Top-Down/Bottom-Up pleated blinds offer you the ability to operate blinds from the top down, the bottom up, or in combination of the two. Quite literally the best of both worlds. 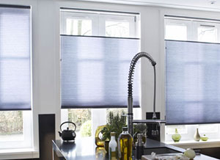 The standard means of operation for a free hanging pleated or duette blinds is the traditional cord lock system, similar to that used on a venetian blind. 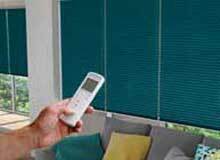 Blinds can be fitted with tensioned cords allowing simple hand or wand operation. This is the standard means of operation for skylight roof blinds, but can also be used for window blinds. SmartRise is a completely cordless system and ultimate in child safety, this cordless push up, pull down system raises and lowers the product with the touch of a finger. Its proprietary design holds the shade securely in any position. SmartRise reduces potential safety hazards, offers more user comfort and a beautifully streamlined appearance. 24vdc motorisation is available with Somfy motors and controls. 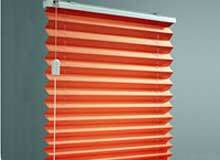 In addition to our standard pleated and cellular blinds we also offer Luxaflex Plisse and Duette blinds. They come with a 5 year manufacturer backed limited warrenty and offer many options such as top-down bottom-up operation. 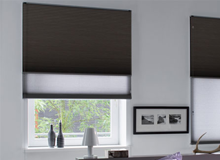 Click here to see our dedicated Luxaflex page.